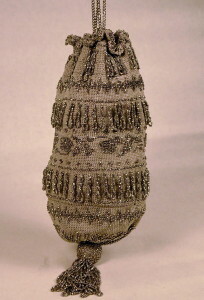 1920's vintage flapper drawstring reticule handbag. Gray crocheted silk and steel cut beads. Beaded geometric and floral pattern banding, with geometric "burst" pattern at bottom. Scallop turn-back ruffle at top edge with bead loops around circumference. Ornamental silver metal long link chain drawstring. Full gray crepe lining with rosette trim at edge.